What is a Grand Canyon rafting adventure? It’s the adventure of a lifetime! It’s a rafting experience, a hiking experience, a relaxing experience, an adrenaline-pumping experience. It’s floating through the bottom of one of the most beautiful places in the world. An adventure not many can say they’ve done. It’s also an expedition and a team experience that encompasses a multitude of wonders and daily challenges. It’s working together to explore Grand Canyon by raft and on foot. This adventure will drill down to what’s most important and basic: shelter, food and safety, but also beauty, comradery and solitude. While down in the Canyon, the outside world shrinks in significance, and we are reminded of what is really most important in life. This adventure will push the limits of your comfort zone, and at the same time, leave you feeling inspired and changed. Are you ready for adventure?! We take folks from all different walks of life on our rafting adventures. We take first-time rafters, experienced rafters, non-swimmers, strong swimmers, extreme outdoor enthusiasts, those who enjoy being outdoors, those new to outdoor adventures, first-time campers and everyone in between! We try and accommodate just about everyone willing to embark on this rafting adventure. This includes a variety of ages and physical abilities, including persons with disabilities. It includes multi-generational families and children as young as 10 years old. Although we don’t have a maximum age, we ask that anyone joining a Grand Canyon rafting adventure understand that there will be physical and mental challenges associated with this backcountry adventure. The Grand Canyon rafting experience will challenge you! Choosing a Grand Canyon rafting adventure means you have assessed your abilities and deem yourself ready for the challenge. Additionally, we encourage you to prepare for the experience by increasing your physical fitness and stamina. Each morning, you will prepare for that day’s adventure. You’ll start with a wake-up coffee call at daybreak. Enjoy your coffee while you pack your personal and sleep gear in your dry bags and disassemble your tent, if you used one. You will then join your fellow rafters for a deliciously-prepared breakfast. Everyone then pitches in with cleaning dishes and breaking down camp, quickly followed by helping load the personal dry bags, camping equipment, kitchen and all other gear onto the boats. Some days you may hike early in the day, and other days, you may hike later. Hikes are almost always optional, and vary from day to day. When you’re not on an excursion by foot, you’re likely on the boats, heading downstream through a mix of flat water and rapids. Some hiking opportunities will be more physically challenging than others, and it will be up to you to decide which hiking experience is best for you. If you choose to skip that day’s hike, you may have an opportunity to sit on the shore and marvel at the canyon walls, read a book or just enjoy the solitude. When you are not camping or partaking in the hikes or shore time, you will likely be on the rafts, heading downstream through a mix of flat water and exciting rapids. During lunch, you’ll help unload and reload a bit, but usually, you’ll have some down time to enjoy the sites. After lunch, you’ll go back to boating or hiking. Around late afternoon or early evening, your guides will find camp and everyone will unload their personal gear, camping equipment and everything else from the rafts. You will set up your personal camp, including setting up your tent, if you use one. Often before dinner, there will be time to explore or to just relax on the beach. A typical evening routine includes a delicious group dinner with dessert, cleaning the dishes and a light shutdown of the kitchen. Usually there is plenty of after-dinner socializing and camp games before you head off to your sleeping bag. As everyone has an early wakeup call, you and the rest of your group will head to bed shortly after sundown. We challenge you to sleep outside of a tent to enjoy the most dazzling star-filled sky! "The canyon is emphatically not an amusement park. It is without handrails, a place where dangers are real. But no less real are the rewards—among them the fact that when you move through an ancient wilderness that has not been compromised, you are reminded of our species’ humble place in it and the fragility of life." We take this adventure seriously and ask that you do, too! Speak with your physician and/or personal trainer about the cumulative effects and fatigue that accompanies a multiple day backcountry adventure. 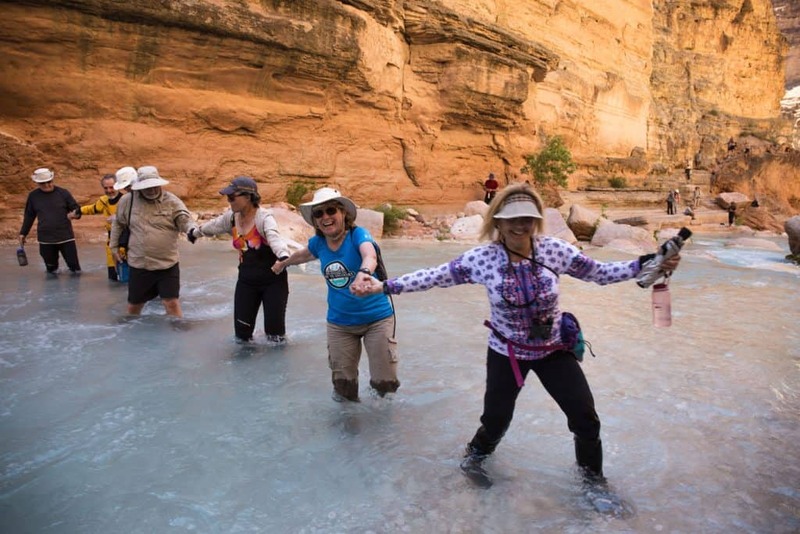 Have your physician and/or personal trainer consider these strengths and exercises needed for a Grand Canyon rafting adventure: cardio pulmonary exercises, endurance exercises, balance, foot work exercises and grip strength exercises. Take this information with you when you speak with your physician and/or personal trainer. The Grand Canyon will impact you, emotionally and physically. Grand Canyon is chock full of extremes: serene and exciting, beautiful and exhilarating, hot and cold, wet and dry. One thing is for sure, you can always count on it being tiring. A Grand Canyon rafting adventure is not a vacation by any traditional sense of the word—it’s much more because you will be so involved and active throughout your day. It’s full of challenges, such as setting up a tent in a sandstorm, staying hydrated in 100+ degree weather, keeping warm after the 48-degree river water soaks you to the bone, hiking amongst loose boulders and traversing along cliff edges. So how dangerous is this trip, really? This activity is not without risk, and given the backcountry Canyon environment, certain risks cannot be eliminated. It is up to you to weigh the risks and hazards and make the best decision for you. We have presented you with many scenarios of risk, but we also invite you to contact us with any and all of your concerns, as most people go on a rafting adventure without a hitch, and most injuries occur off the water. Our guides are highly trained to assist in on-water and off-water rescues, and they will prepare you in how you can self-assist if the need arises, as well. When all is said and done, we LOVE Grand Canyon and our passion is to share it with you! We are passionate about sharing this unique place with you! We love the ancient rocks, the pristine beauty, the abundant wildlife, the history of the ancestral people, the stories of the early explorers and of course the rafting. We’ll guide you through Grand Canyon in hopes that you’ll end up sharing our passion and commitment to preserving and protecting this most fragile and beautiful place. We can’t wait to share it with you! What are you waiting for? Come on an adventure with us! If you have any questions or concerns, call our office anytime between Monday through Friday, 9-4 PM MST (AZ does not observe daylight savings time). We’re also available and happy to assist you via email. We hope to see you downstream! Header photo by Ronen Yaari. See his Instagram account here.